It’s hard not to think of our grandparents how we most often saw them – as grown adults, perhaps even elderly. I think of my great grandfather as a man in his 90’s, sitting in a chair in his house on Osborn Avenue and waving his cane at me. Documents such as census records make it easier to imagine them in a different time in their lives. In 1940, the Witt family lived at 24 Osborn Avenue, just north of Mahoning Avenue. When a census enumerator visited the house, my great grandfather Francis was 41 years old, and my grandfather Howard just a boy of 11. Francis Witt, head, male, white, 41 years old, married, has not attended school since March 1, 1939, attended school through 8th grade, born in Ohio, on April 1, 1935 lived in same place, was at work for pay the week of March 24-30, 1940. Works 40 hours a week as a business agent in a repair shop, worked 26 weeks in 1939. Earned $800 wages in 1939, with no wages from another source. Helen ” , wife, female, white, age 41, married, has not attended school since March 1, 1939, attended school through 8th grade, born in Ohio, on April 1, 1935 lived in same place (not a farm), did not work or seek work. M. Governor ” , son, male, white, age 20, single, born in Ohio, on April 1, 1935 lived in same place, has attended school since March 1, 1939, attended school through C-2 (College, 2 years), in school for 52 weeks; wages of $450. No job listed. Francis ” , son, male, white, age 19, single, has not attended school since March 1, 1939, attended school through 12th grade, born in Ohio, on April 1, 1935 lived in same place, was seeking work. Duration of unemployment up to March 30, 1940—in weeks: 20 weeks. Otherwise works as an order clerk at a steel mill. In 1939, worked 12 for $300 in wages. William ” , son, male, white, age 17, single, has attended school since March 1, 1939, attended school through 11th grade, born in Ohio, on April 1, 1935 lived in same place, did not work or seek work. Fred ” , son, male, white, age 15, single, has attended school since March 1, 1939, attended school through 8th grade, born in Ohio, on April 1, 1935 lived in same place, did not work or seek work. Howard ” , son, male, white, age 11, single, has attended school since March 1, 1939, attended school through 4th grade, born in Ohio, on April 1, 1935 lived in same place, did not work or seek work. Helen K. ” , daughter, female, white, age 6, single, has not attended school since March 1, 1939, born in Ohio, on April 1, 1935 lived in same place, did not work or seek work. 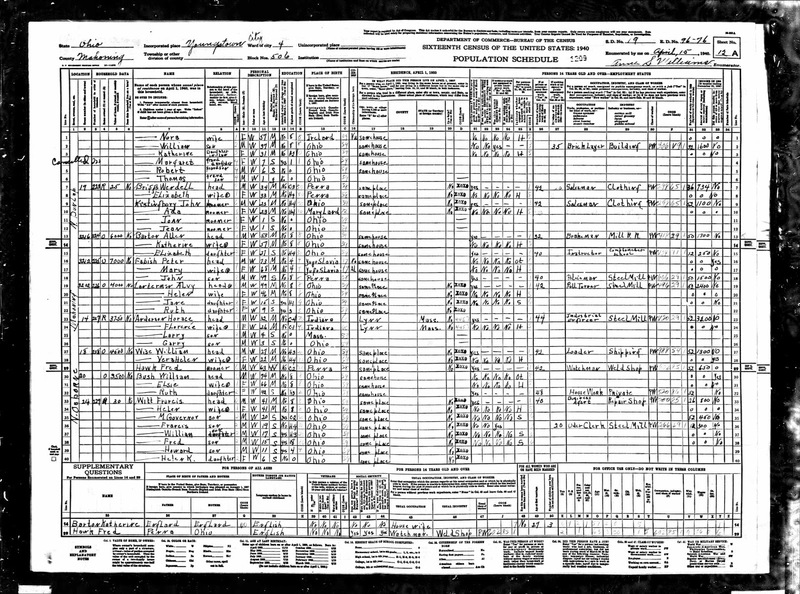 1940 U.S. Federal Census, Mahoning County, Youngstown, population schedule, Enumeration District 96-76, Sheet 12A, Dwelling 229,. Francis Witt; digital image, Ancestry.com (http://www.ancestry.com : accessed 28 July 2013), citing National Archives microfilm publication Roll T627_3270. Petro, Diane. (Spring 2012). Brother, Can You Spare a Dime? The 1940 Census: Employment and Income. Prologue Magazine. Volume 44 (Issue 1). Retrieved from http://www.archives.gov/publications/prologue/2012/spring/1940.html. Accessed 28 July 2013. ← Friday’s Faces of the Past – Grandpap, Pap, Charles and Jr.